Anne Marie decided to become a dental hygienist because of her love of working with people. She obtained her Bachelor’s Degree at Assumption College after receiving her Associate’s degree in Dental Hygiene at Quinsigamond Community College. 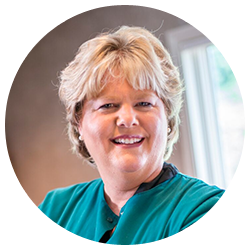 Anne Marie has been in the dental field for 32 years and has been at Welcome Smiles for 15 years. She strives to make her patients knowledgeable about dental health and to help them understand their treatment. When she isn’t in the office, you can find Anne Marie passionately pursuing her love of education and dentistry. She enjoys taking continuing education courses and has worked to obtain her Anesthesia License in the state of Massachusetts.